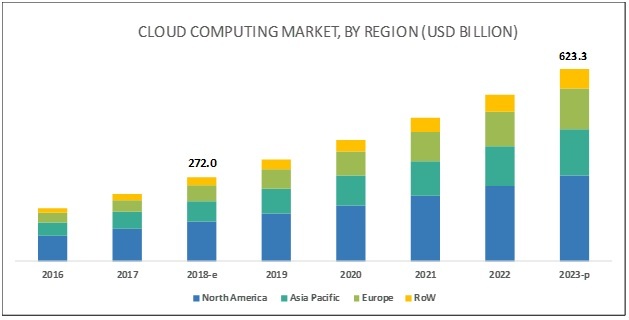 [149 Pages Report] The global cloud computing market size is expected to grow from USD 272.0 billion in 2018 to USD 623.3 billion by 2023, at a Compound Annual Growth Rate (CAGR) of 18.0% during the forecast period. Increased automation and agility, need for delivering enhanced customer experience, and increased cost savings and return on investment are major growth factors for the market. Increased user and resource mobility, ongoing migration of applications over the cloud, and the emergence of more sophisticated threats are leading organizations toward the adoption of hybrid cloud. Industries, such as healthcare, BFSI, and government, which prioritize compliance, security, and customer experience opt for the hybrid deployment model. Leading cloud vendors are focusing on improving their presence in hybrid cloud space; for instance in October 2018, IBM acquired Red Hat. The acquisition helped IBM gain access to larger customer base and extensive cloud portfolio of Red Hat. Organizations with employees between 1 and 999 are categorized under the SMEs segment. Cloud computing services are being rapidly adopted by SMEs, due to the ease and flexibility they offer; the demand is expected to grow during the forecast period. The benefits, such as seamless scalability, flexibility, pay-as-you-go payment model, reduced operational costs, and customized offerings as per business requirements are facilitating the adoption of cloud services among SMEs. APAC is expected to provide significant growth opportunities during the forecast period. The increasing availability of skilled labor and keen focus provided by SMEs and large enterprises to enter and grow in this region are a few factors driving the adoption of cloud computing in this region. Especially, public cloud services have gained huge traction in APAC, as enterprises seek to enhance their digital initiatives. With the pressure to achieve greater business agility and satisfy their customers, cloud computing has become the core of how many businesses operate nowadays. Organizations are working on optimizing both application performance and ensuring good customer experience. Major vendors in the market include AWS (US), Microsoft (US), Google (US), Alibaba (China), SAP (Germany), IBM (US), Oracle (US), VMware (US), Rackspace (US), Salesforce (US), Adobe (US), Verizon (US), CenturyLink (US), Fujitsu (Japan), and NTT Communications (Japan). AWS, a key player in the market, provides a comprehensive range of services. AWS has also adopted organic growth strategies to maintain its leading position in the market. For instance, in July 2018, AWS launched EC2 compute instances for its Snowball Edge appliance. The availability of EC2 compute instances would give the appliance an edge over other appliances that target production environments. In October 2018, IBM launched Multicloud Manager, a management technology that enables businesses to manage, shift, and integrate applications across cloud environments. Multicloud Manager’s benefits include increased visibility across clouds, improved governance and security, and consistent application management. In September 2018, Google and Attunity expanded their collaboration, wherein Attunity would expand its data integration solutions for Google’s GCP. These solutions would enable the accelerated and real-time delivery of cloud migration, and cloud data lake adoption on GCP. Moreover, Attunity’s support for GCP enables customers to save the costs and time required for cloud development, rapidly deploy Google Big Query Data Warehouses, and automate the creation of analytics-ready Hadoop and Hive data sets. In October 2018, Alibaba Cloud signed an agreement with Kongsberg Digital to promote digitalization in the energy sector by making Kongsberg Digital’s industrial digital platform, Kognifai, available on Alibaba Cloud's infrastructure. Both the companies are focused on offering advanced digital solutions to the energy sector in China and other Asian countries. What are the upcoming industry applications for the cloud computing market? The study involved 4 major activities to estimate the current market size of cloud computing services. Exhaustive secondary research was done to collect information on the market, the peer market, and the parent market. The next step was to validate these findings, assumptions, and sizing with industry experts across the value chain through primary research. Both top-down and bottom-up approaches were employed to estimate the complete market size. After that, the market breakup and data triangulation procedures were used to estimate the market size of the segments and subsegments. In the secondary research process, various secondary sources were referred to for identifying and collecting information for this study. The secondary sources included annual reports, press releases, and investor presentations of companies; whitepapers such as Cisco Cloud Index; certified publications; and articles from recognized associations, such as data center knowledge and government publishing sources. Secondary sources such as Factiva and D&B Hoovers were also considered for this study. Secondary research was mainly used to obtain key information about the industry’s value chain, the total pool of key players, market classification and segmentation as per the industry trends to the bottom-most level, regional markets, and key developments from both market and technology-oriented perspectives. In the primary research process, various primary sources from both the supply and demand sides were interviewed to obtain qualitative and quantitative information for this report. Primary sources from the supply-side included industry experts, such as Chief Executive Officers (CEOs), Vice Presidents (VPs), marketing directors, technology and innovation directors, and related key executives from various key companies and organizations providing cloud computing services. The primary sources from the demand side included the end-users of cloud computing services, which included Chief Information Officers (CIOs), IT technicians and technologists, and IT managers at public and investor-owned utilities. After arriving at the overall market size—using the market size estimation processes as explained above—the market was split into several segments and subsegments. To complete the overall market engineering process and arrive at the exact statistics of each market segment and subsegment, the data triangulation and market breakup procedures were employed, wherever applicable. 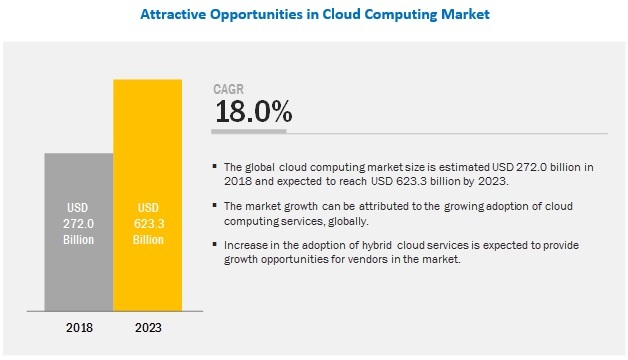 The data was triangulated by studying several factors and trends from both, the demand and supply sides, in the cloud computing market.